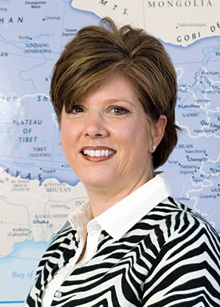 Pam Redmon, executive director of the Global Health Institute–China Tobacco Control Partnership. Emory Photo/Video. 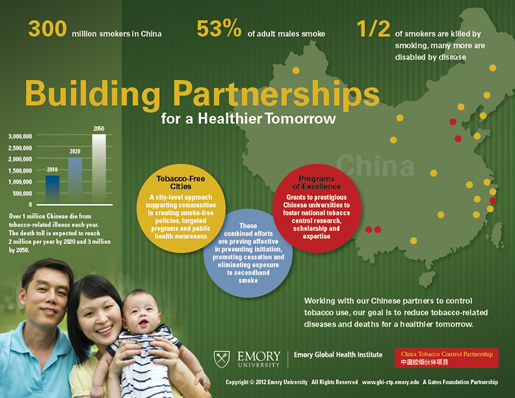 The China Tobacco Control Partnership was established in 2008 within Emory’s Global Health Institute to reduce the health, social, environmental and economic burdens of tobacco use in China. Funded by the Bill & Melinda Gates Foundation, the partnership has established tobacco control programs in 17 Chinese cities aimed at changing the social norms of tobacco use. The partnership also supports five Chinese universities to advance tobacco control research, scholarship, and expertise. There are more smokers in China than there are people living in the United States. China today, in terms of cigarette smoking, is comparable to the U.S. some 40 years ago, and smoking is a socially acceptable behavior. An interesting difference is that 53 percent of men, but slightly more than two percent of women, smoke. Fewer than 20 percent of Americans smoke today. Also, seven out of 10 non-smoking adults report being exposed weekly to secondhand smoke. The China Tobacco Control Partnership hopes to see an accelerated decline among Chinese smokers in the years to come. The Chinese culture is very accepting of tobacco use. Gifting cigarettes is a tradition in China, and people give expensive brands of cigarettes to their doctors, government officials, and important people in their lives. On Chinese New Year, at weddings and other holidays and events, cigarettes are a favored and beautifully packaged gift. China is the largest producer of tobacco products in the world, so there is much resistance to anti-smoking initiatives. Because China’s tobacco industry is state owned, the central government profits greatly from the revenue. In 2010, close to eight percent of China’s gross profits came from taxes and sales of tobacco products. The strategies of the China Tobacco Control Partnership fall into three categories: policies, programs, and health communications/media advocacy. Smoke-free policies and increases in the price of cigarettes through taxation have been proven to reduce tobacco use. When properly enforced, smoke-free policies can go a long way to protect non-smokers from secondhand smoke and to encourage smokers to quit. When smoking is cost prohibitive, consumption decreases. Along with these policy changes, there is a need to educate the population about the harms of tobacco use and secondhand smoke through media messaging and targeted educational programs. In China, only about 23 percent of the adult population understands that smoking is a deadly habit. Tobacco use is the single most preventable cause of disease and death in the world. The goal of the program is to dramatically change social and cultural norms — helping people understand that smoking is harmful to them and others around them, and that it can cause serious illness and death. Progress toward reducing the attractiveness and acceptability of tobacco use will have a tremendous impact in preventing initiation of smoking, protecting the non-smoker from secondhand smoke, and encouraging the smoker to quit. The Tobacco-Free Cities Program is unique in China. The program includes 17 cities and 17 different plans of action. Rather than providing grantees with a standard program plan, each city considers its own unique situation and its own stage of readiness, then determines for itself where it can have the greatest impact in changing social norms around tobacco use. The cities program began with training and planning activities that could promote changes in social acceptability of tobacco use, as well as strategies to address the needs of different population sectors, such as in schools, medical centers and public places. Partners were trained to conduct a situational analysis within their cities to determine available resources and identify areas of greatest need. Some found they already had smoke-free regulations, but these policies were not being enforced. The cities selected their areas of focus, and the partnership continually works with them to determine ways to better educate the populace, and partner with city government and organization leaders to create, strengthen, or enforce policies. City government support is an important key to success, and when the city leadership gets behind the effort, great things can happen. In fact, city mayor support of the Tobacco Free Cities program was a grantee requirement. By initiating movement at the local level, social norm change can occur and ultimately spread throughout the nation of China. View or download a larger version of this infographic. While tobacco control programs are essential to changing social norms and reducing smoking, equally important is the development of Chinese research, scholarship, and expertise in areas relevant to tobacco prevention and control. Through a competitive Request for Proposals, the partnership selected and funds five universities to conduct research in the areas of policy, behavioral and social science, crop substitution, and "best practices," in tobacco control. To support research efforts and foster networking, the partnership sponsored the first tobacco control research symposium in China last fall. They hosted approximately 200 researchers, scholars, and practitioners in a three-day event focused on current and important China tobacco control research efforts. The agenda and presentations are available. This article is adapted from the Emory Academic Exchange newsletter. View an interactive map of the 17 Chinese partner cities receiving grant funding for tobacco control programs. See the location of five universities and research institutions selected in 2010 for Programs of Excellence in research, scholarship and expertise. Compilation of media coverage over the years.